Since vanilla is so popular, it was surprising to learn how challenging it is to grow it in the wild! 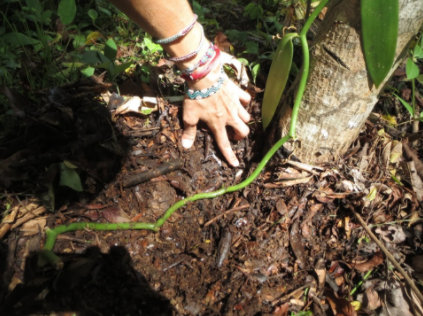 Vanilla is one of the many rare and distinct plants that can be found in the Osa. The uniqueness of the vanilla plant is fascinating, and its potential to both reforest and spur regional development is heartening in a field that can often be cynical. As an intern in Osa Conservation’s Washington, D.C. office with a strong interest in botany, I find the traits and characteristics of the vanilla plant incredibly enticing. Vanilla is the most popular flavoring in the world, the second most expensive, and an incredibly time- and labor-intensive crop. In the 17th century, factories to manufacture the vanilla flavor began to emerge throughout Europe. Vanilla became a common commercial crop in 1841 after Edmond Albius discovered an effective method for hand pollination. This is still the dominant harvesting methodology today. The vanilla grown in Costa Rica is a Vanilla planifolia. The vanilla vine grows on a host tree, and if unattended, can grow up to 30 meters and reach the tops of forests. The vanilla bean is the fruit of the Vanilla orchid, and is the only edible fruit of the 25,000 orchid species native to Central America and the surrounding regions. The vanilla flower only blooms for 24 hours, and if it is not pollinated, the plant dies and the beans cannot be used. There are over 50 species of vanilla, but only a few of them are used for flavoring. Vanilla must be grown in a moist, tropical climate between 75 and 85 degrees Fahrenheit, and between 10 and 20 degrees north and south of the Equator. It is impossible to grow the same vanilla vine in the more than one country because of soil and climate variances, so each growing region produces vanilla with a slightly different flavor. Manual pollination of the vanilla plant is done with a very small stick and takes a great amount of time and precision. Fertilization by a native species is incredibly rare—so rare, in fact, that scientists are unsure of exactly which species are pollinators. It has been suggested that the Melipona bee is a vanilla pollinator, but its small size makes is an unlikely candidate. 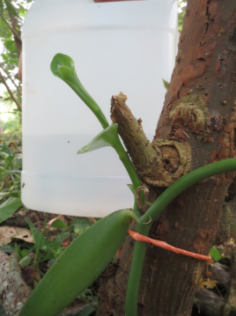 Conservation of the vanilla plant is of paramount importance. Its labor-intensive cultivation, niche growing environment, short life-cycle, and extraordinarily high demand place a great deal of pressure on vanilla crops. That is why Osa Conservation is excited to help further this conservation research! An exciting project is under development, so stay tuned for more information on what is happening in the field as Osa Conservation works towards gaining a better understanding of the role of vanilla in the rainforest. Osa Conservation’s BioStation is the perfect place to conduct further research on the vanilla plant and its pollination. We have several vanilla plants, both wild and domesticated, that researchers can observe and study, and maybe even use to find new solutions to the problems of deforestation, regional underdevelopment, and vanilla shortage!